Angela Park chipped onto the ninth green yesterday. Angela Park had never won a tournament on the LPGA Tour and was in good position to do so making the turn during yesterday's final round of the SBS Open. The 19-year-old had pulled within one shot of the lead by shooting 3 under on the front side, but bogeyed the par-4 10th to begin a back-nine odyssey she'd just as soon forget. She was on the clock at the par-4 10th on her second, third and fourth shots before settling for a bogey. As she walked to the 11th hole, the LPGA rules officials informed her that she had been assessed a two-shot penalty on the 10th for slow play, in effect, giving her a triple bogey on the hole to drop her back to four under for the tournament. She stepped up her play to birdie five of the final eight holes with a couple of bogeys thrown in for good measure to finish in a tie for fifth at 7-under 209, good enough to earn her $40,872. But it hardly mattered. At the scorer's tent by the 18th tee, you could see that Park had taken things to heart as she cried openly while signing autographs. Caddie Mike Hobbs thought the penalty was unfair and said as much to any and all who would listen. Park was whisked away to talk about her round on The Golf Channel where she was asked her thoughts on what had happened. 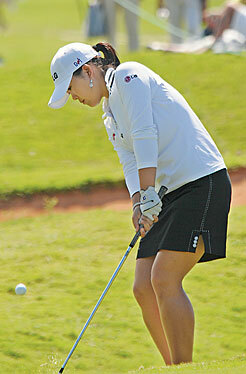 "I really don't think it's fair because I was in contention," Park said. "I don't think it's fair at all. I was so mad out there. I was flying through the course on the back nine. I was so frustrated." She said later that she wasn't holding up play and that the penalty was unwarranted. "Next week will be a better week or a faster week I must say," Park said. "There were some things that happened at the 10th that slowed play. It wasn't fair. It wasn't right." Without the penalty, Park would have finished alone in second. It cost her almost $60,000. The LPGA official (Doug Brecht), involved in this matter is the same one who penalized Cristie Kerr at last year's Fields Open that left Kerr fuming the entire event. Park was equally upset. Had she not opened with a 75 on Thursday, Park would have been the woman to beat. Over the final two days, she managed 16 birides -- eight each round. Laura Diaz was excited about finishing in a tie for second, just two shots off the pace set by winner Annika Sorenstam. But the 32-year-old from New York needs victories if she's to qualify for the Hall of Fame. She only has two in her career, but still has managed to win $4.1 million. Her best finish last year were two ties for third. Diaz has already bettered that in one event this year and hopes it's a portent of things to come. "Yes, I feel great," Diaz said, who closed with a 70 to finish at 8-under 208, tied with Russy Gulyanamitta and Jane Park. A double bogey at the par-4 sixth still stuck in her craw, but all in all, it was still a good opening performance. "But my goal is to get in the (LPGA Tour and World Golf) Hall of Fame. I need wins to get there. Seconds, unfortunately, don't put you there in that spot. I'll keep working, and I'm confident that it's around the corner." The average scoring round for the three days at Turtle Bay was 73.184. The lowest round of the week was yesterday in relatively calm conditions at 72.189. The hardest hole for the week was the par-4 17th with only 33 birdies, 198 pars, 105 bogeys, 19 double bogeys and two others. The easist hole for the week was the par-5 third hole with four eagles, 128 birdies, 205 pars, 18 bogyes and two double bogeys. Sorenstam hit 81 percent of the fairways, 85.2 percent of the greens and needed only 89 putts to secure the win. Her average drive was 251.8 yards, but she used a 4-wood on many of the tees to avoid hitting through the fairways and into the rough.